I haven’t blogged anything since I got back from my vacation. Things have just been crazy since I got back, which made my personal projects suffer a bit. I’m gonna get back on track now though. To get my juices flowing and get back in the groove I started a new project today (again… hehe). 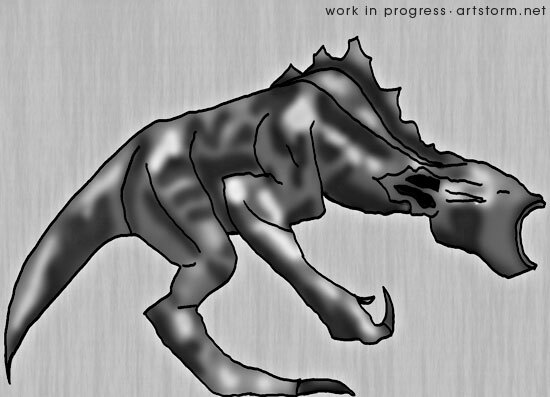 Well, this will not be a long project, just me playing around with a new character, or creature really, of mine. As I’ve been spending quite some time getting up to speed with ZBrush 3 lately, I wanted to make a project from start to finish using ZBrush so I get some reward for all the hours I’ve put into that application so far. I do think all my hours will pay off and that I can get an image through all the steps required in quite a short time. Or so I hope. I have to admit, back in the 1980’s I was an addicted Role Player. Playing games like Dungeons and Dragons (and the Swedish version Drakar & Demoner), as well as other RPG’s like Mutant, The Lord of the Rings, Star Wars, Kult and Chock. Well, even though I haven’t been into that for almost 20 years now, it’s an enormous well to collect inspiration from. 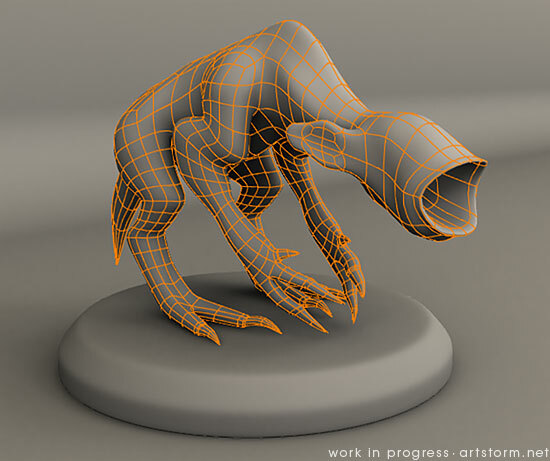 So I dug up my old Advanced Dungeons and Dragons Monster Manual and started hunting for a nice creature to sculpt in 3D. I had a hard time to decide, so many ultra cool creatures in that universe, but finally I went with a destrachan. Alright, so I took a good look on the illustration in the Monster Manual and started up Photoshop and sketched out a quick modeling sheet with my Wacom, tried my best to draw an orthographic side view so I would have something to work from when starting to build the polygon mesh. And this concept sketch is what I came up with. Nothing fancy really, but it fills its purpose for this stage. Anyway, after I had finished this sketch, I started up LightWave 3D, loaded my sketch into the background and started modeling out a base mesh. And after about half an hour I had something I was happy with. Not very detailed, but I got the basic shapes down and the edgeloops located where I wanted them. Here is a wireframe and a render of my base mesh of my destrachan model. As can be seen, this base mesh is very low resolution, but it contains all the details and shapes I need to have a very good and fun mesh to start sculpting from. 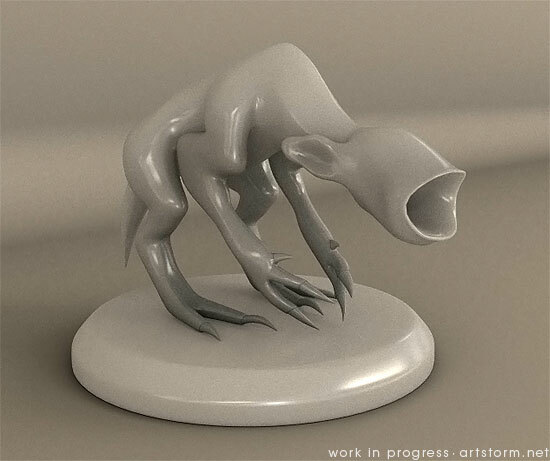 So time to bring this guy into ZBrush and bring out all the lovely details to make this creature come alive. This base mesh is just around 1400 polygons, which is a good starting point for ZBrush work. Nu har jag tittat på Dina bilder. Kan inte låta bli eftersom min yngste son också håller på med sånt här. Han ritar dataspel i LA numera. Du kan hitta hans blogg om Du vill på min bloggrulle. Men Ni kanske känner varandra redan. Det är en lite värld tror jag. Fantastic blog/site. Gives us civilians an idea on what goes on behind the scene when it comes to CGI movies.